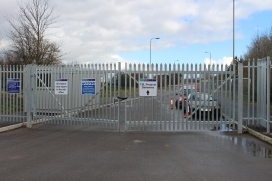 Using a double walled mesh system our twin wire clad gates are a secure and cost effective access solution. Framed in sturdy 60x60mm hollow steel section with 200×50 (656) mesh welded into the frame. 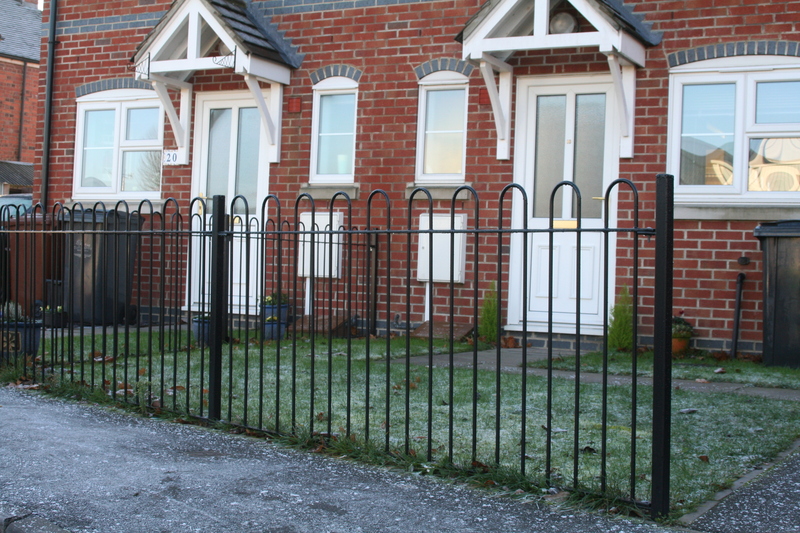 All our gates are supplied with free standing gate posts, lockable slide latch, with drop bolts to double leaf gates. 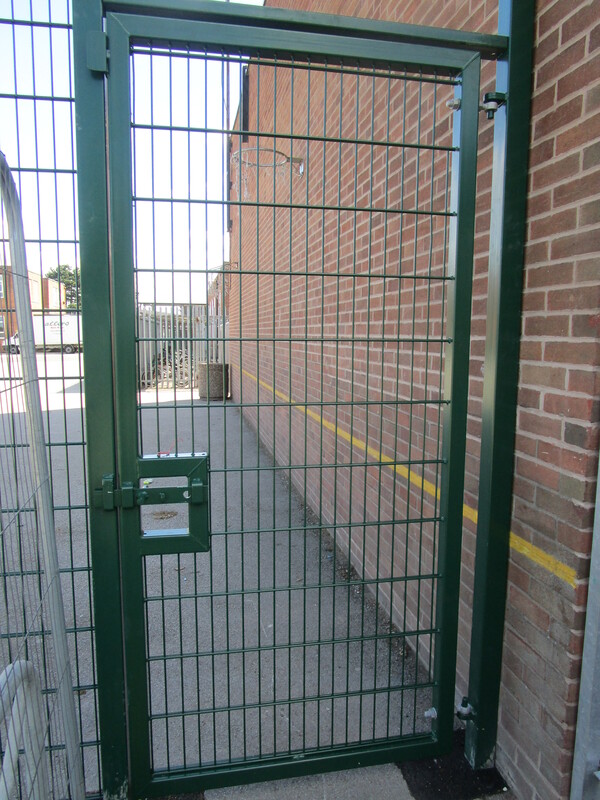 Our stock twin wire gates come in a galvanised and polyester powder coated RAL 6005 (green) finish. Other finishes are available with a 7-10 day turnaround. 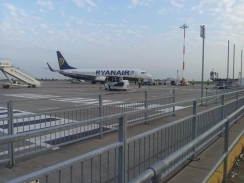 Stock lines may be eligible for next day delivery. 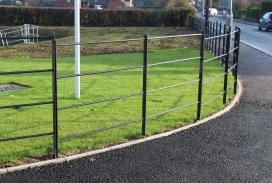 If we do not stock the size or finish of twin wire gate you require, please ask about our bespoke manufacturing service. 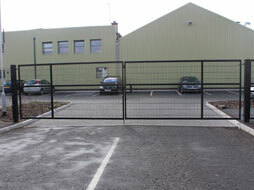 As we manufacture all our own gates we are able to supply bespoke sizes at competitive rates. 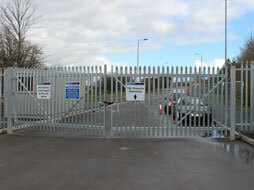 We can also provide gates to suit a variety of mesh systems. For further help and advice please contact a member of our sales team. 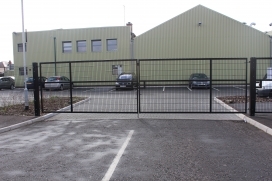 A high security gate ideal for commercial and industrial premises. 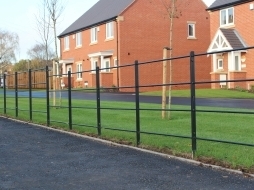 Our palisade gates are framed in hollow steel section and supplied with 2.5mm ‘W’ triple point pales. 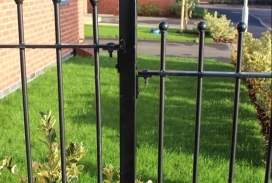 All our gates are supplied with free standing gate posts and lockable slide latch, with drop bolts to double leaf gates. Our stock palisade gates are available in standard heights of 1800mm and 2400mm. 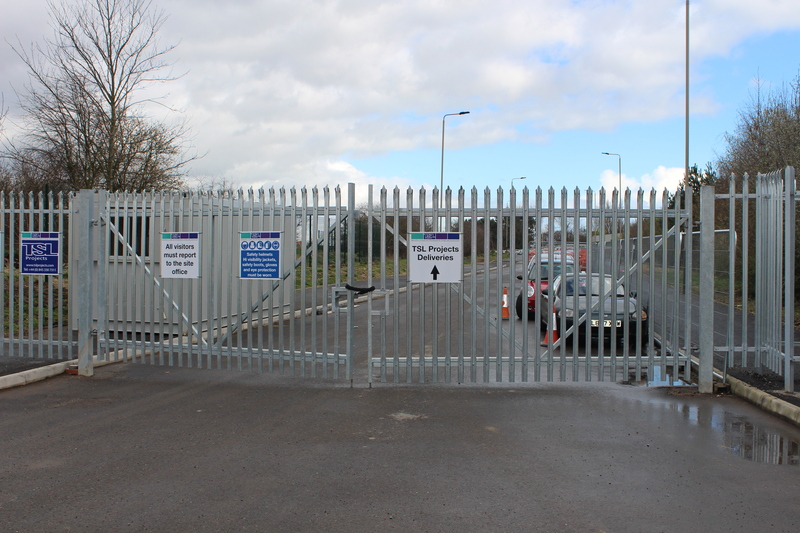 Single gates are available from stock in 1200mm width. 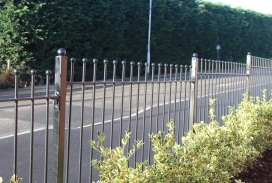 Double leaf gates are available from stock in 3000mm and 5000mm widths. 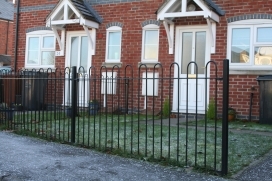 All stock palisade gates come in a galvanised finish. 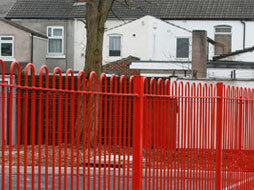 Gates can be polyester powder coated if required. Stock lines may be eligible for next day delivery. 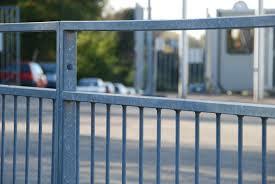 If we do not stock the size or finish of gate you require, please speak to a member of our sales team. As we manufacture all our own gates we are able to supply bespoke sizes at competitive rates. An effective barrier for the safety and protection of pedestrians. These 2000mm long panels are framed in 50x30mm hollow steel section, with a 12mm diameter infill at 112mm centres. 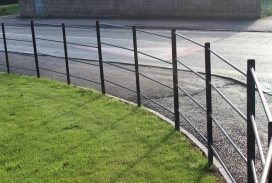 Our pedestrian guardrail is designed to be fitted into the ground to a height of 1000mm. We stock both standard panels and panels which include a vision gap to the top for areas where greater visibility is required. 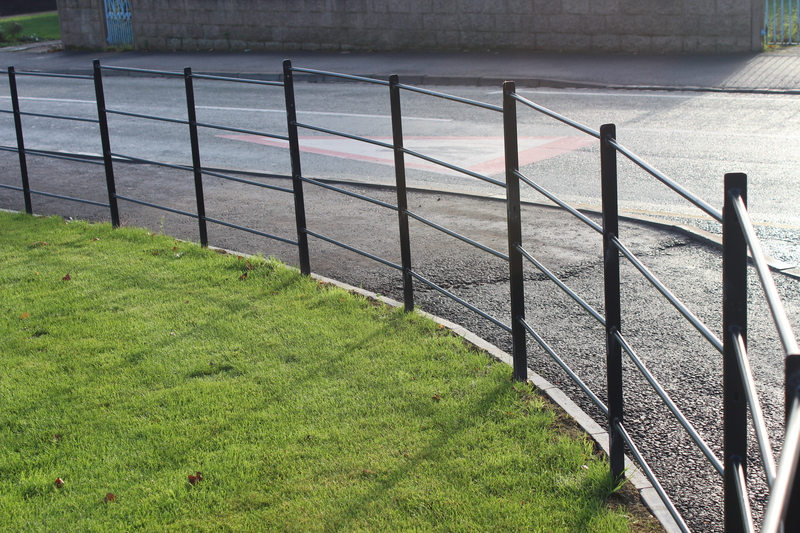 Our pedestrian guardrail comes in a protective galvanised finish as standard. Polyester powder coating is available. 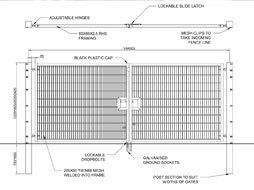 We are able to offer bolt down panels with a 7-10 day turnaround. Stock lines may be eligible for next day delivery. 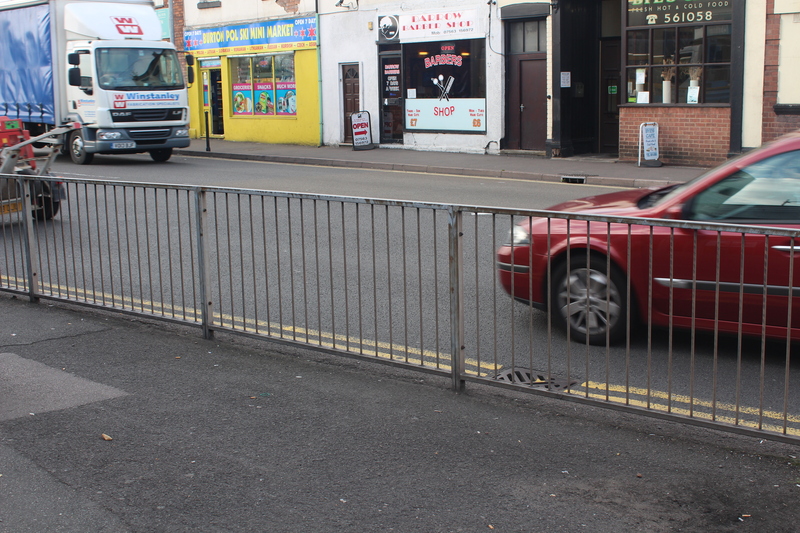 If we do not stock the size of finish of the guardrail you require, please speak to a member of our sales team. As we manufacture all our own products, we are able to supply bespoke sizes at competitive rates. Elegant, decorative railing available in 900mm high or 1200mm high panels. 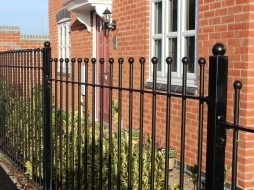 These railings comprise 2 horizontal rails in 40x8mm flat bar with a 12mm diameter solid infill topped with a 25mm diameter ball. 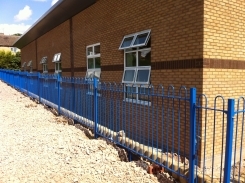 Panels are available in 2000mm or 2750mm lengths and are supplied with a 50x50mm hollow steel section flat top post, loose cleats and anti vandal fixings. Additional posts can be purchased separately. 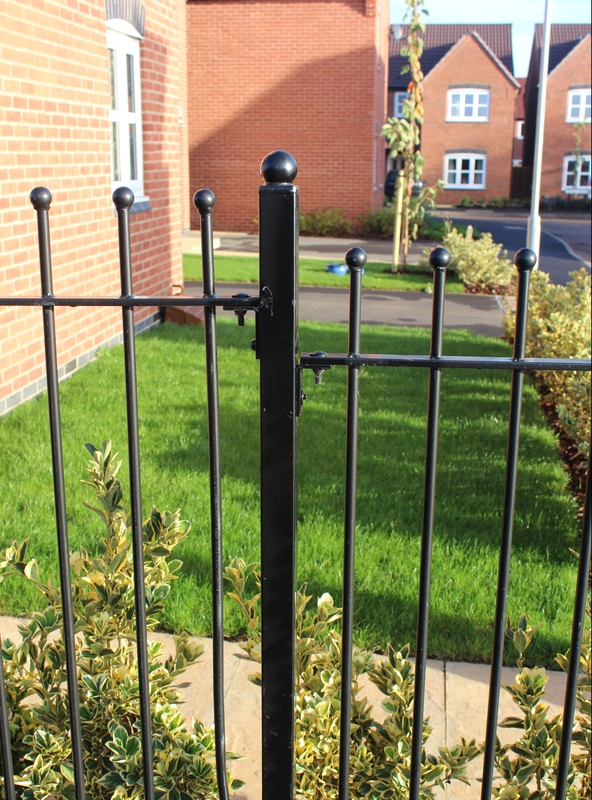 All stock ball top railing is galvanised and finished with a polyester powder coating in RAL 9005 (black). Stock lines may be eligible for next day delivery. 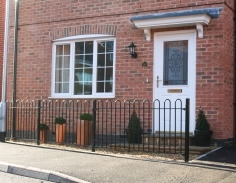 If we do not stock the size or finish of railing you require please speak to a member of our sales team. As we manufacture all our own products, we are able to supply bespoke sizes at competitive rates. 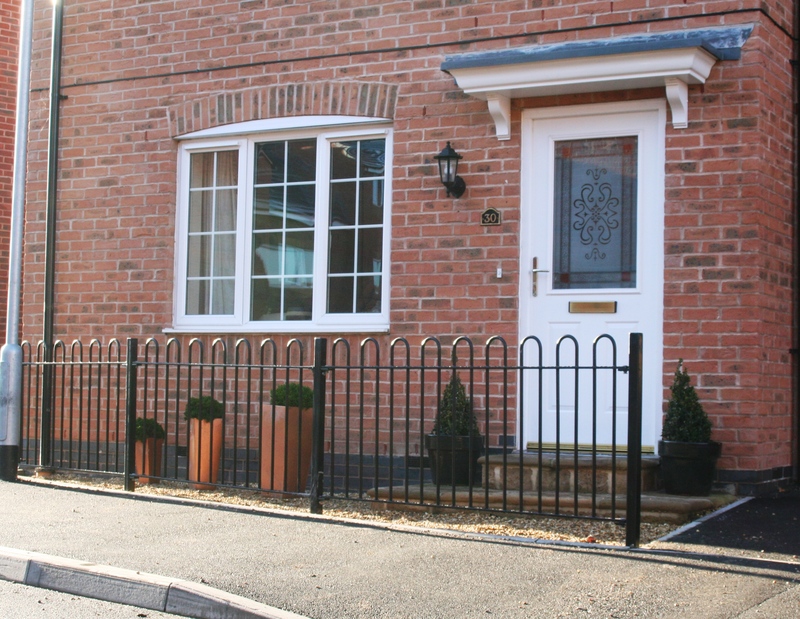 A popular choice of residential railing available in 900mm high or 1200mm high panels. Comprising 2 horizontal rails in 40x8mm flat bar with a 12mm diameter solid infill at 112mm centres. 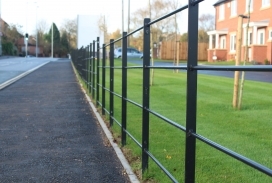 Panels are available in 2000mm or 2750mm lengths and are supplied with a 50x50mm hollow steel section post, loose cleats and anti-vandal fixings. Additional posts can be purchased separately. 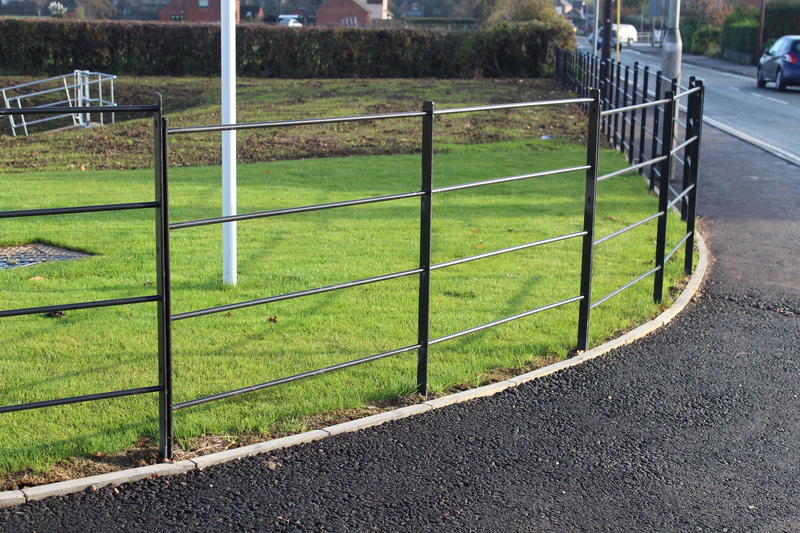 All stock bow top railing is galvanised and finished with a polyester powder coating in RAL 9005 (black). Stock lines may be eligible for next day delivery. if we do not stock the size or finish of railing you require please speak to a member of our sales team. as we manufacture all our own products, we are able to supply bespoke sizes at competitive rates. A traditional railing style with increasing popularity, available in 900mm and 1200mm high panels. These railings comprise a top horizontal rail in 20mm diameter solid bar, with 25x5mm flat bar lower rails between uprights of 40x10mm flat bar. 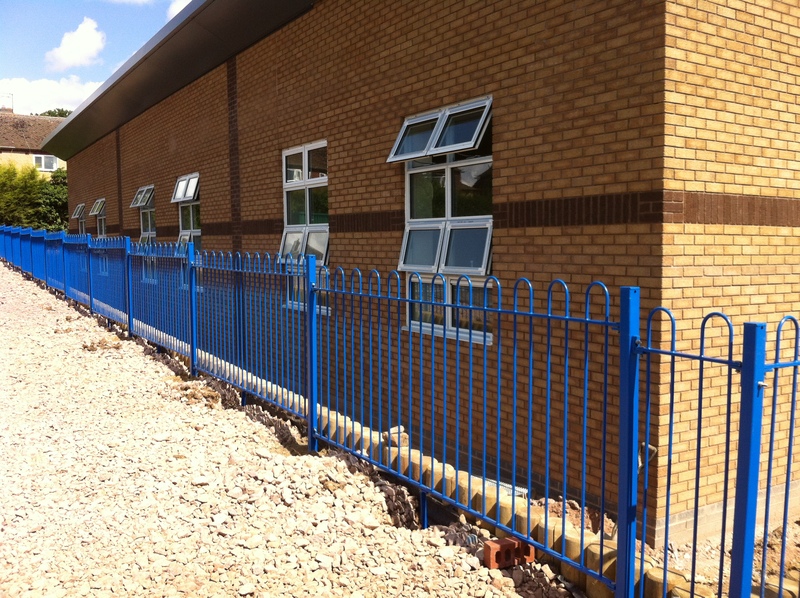 Panels are supplied as 2000mm long back-to-back panels complete with anti-vandal fixings. All stock estate railing is galvanised and finished with polyester powder coating in RAL 9005 (black). Stock lines may be eligible for next day delivery. 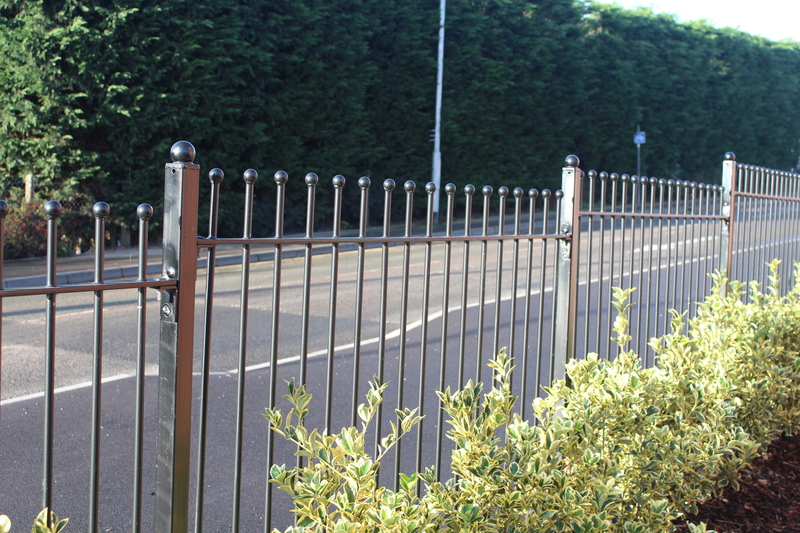 If we do not stock the size or finish of railing you require, please speak to a member of our sales team. As we manufacture all our own products we are able to supply bespoke sizes at competitive rates.